Difficulty Notes: Some easy scrambling if you take the shortcut route that I did. The weather during the work week (of course) has been gorgeous so far in late April and early May 2018. Sitting in the concrete jungle, looking out at another gorgeous day made me leave the office 20 minutes early, jump in my truck and start driving to the mountains to see what I could hike in the evening. 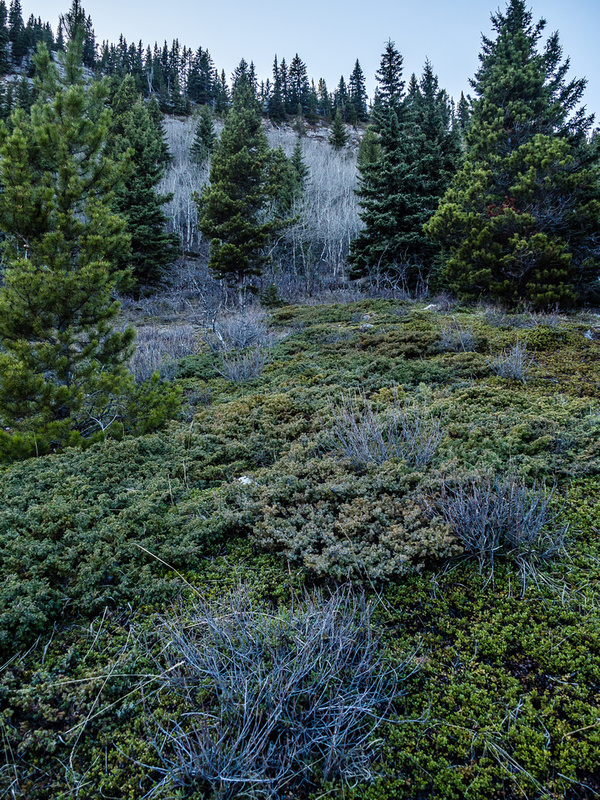 I knew from doing Hell’s Ridge and Etherington Baril Ridge on the weekend, that although there was still snow on the ground in the Eyrie Gap area of the Highwood Range, there wasn’t a copious amount of it. 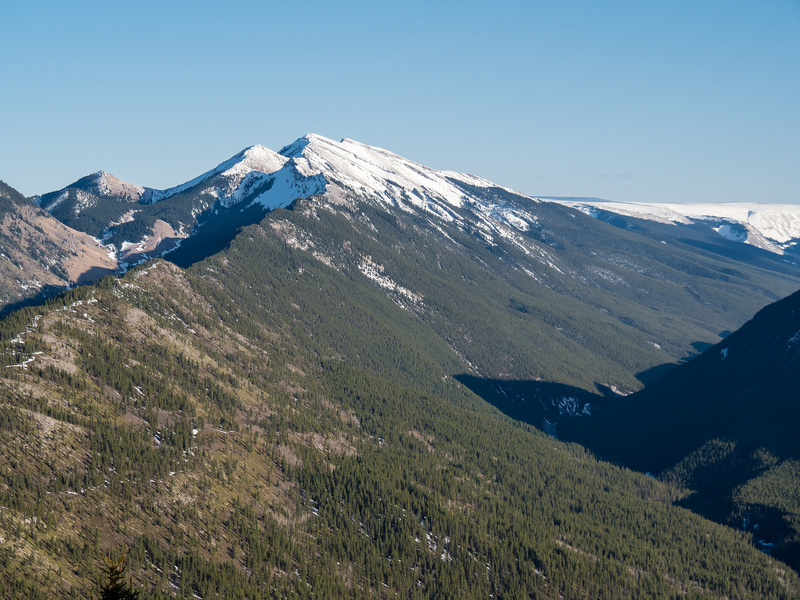 I decided it was time to finally ascend the mighty Mount Mann, looking over Eyrie Gap and guarding Kananaskis Country along the Highwood River and highway 541 from Longview. The funny thing with Mount Mann, is that I constantly assume I’ve already done it. Even while typing up my Hell’s Ridge trip report, I was searching my summit list for “Mann” and getting all confused when it didn’t show up. I think after doing Gunnery Mountain I just always assumed for some reason that it included Mann, which of course it doesn’t. Some people might wonder why I even bother with these front range, tiny bumps and hills. Am I relentlessly obsessed with summits, no matter their size or import? 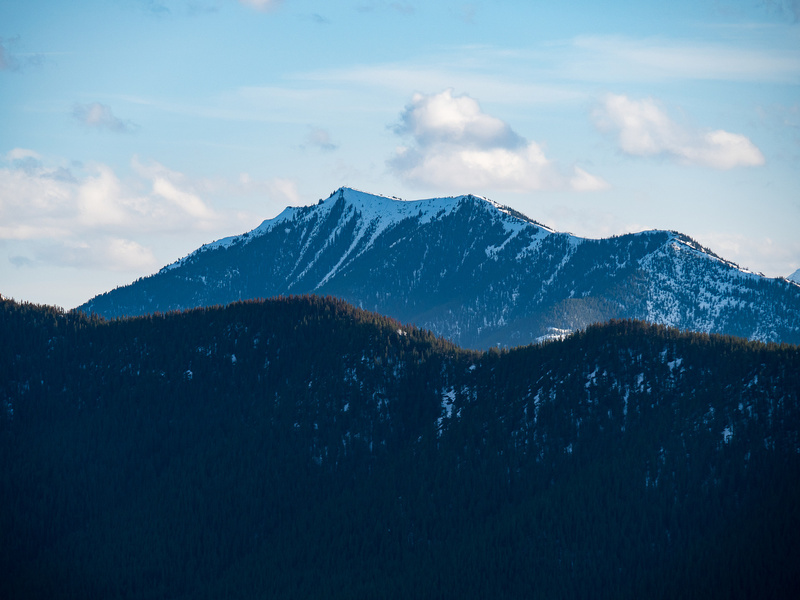 Do I love hiking up grassy, forested ridges? 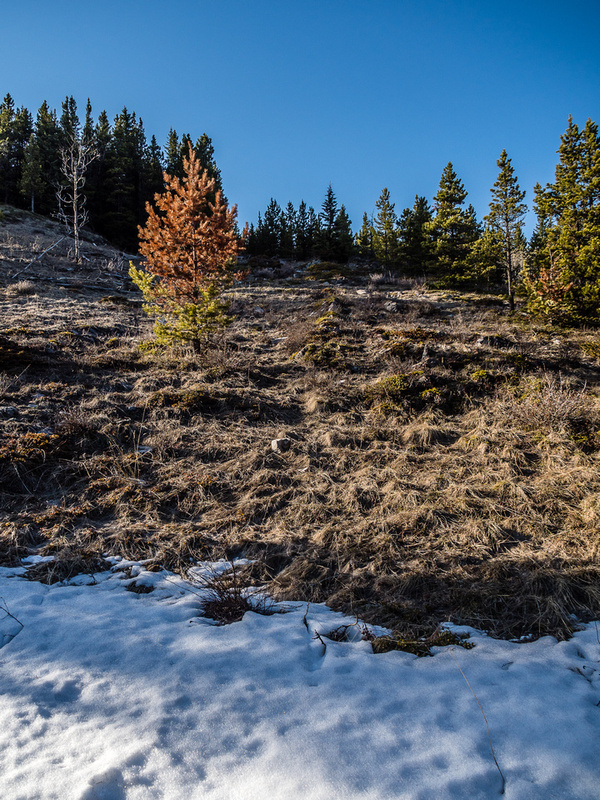 Would I rather hike up a grassy, treed bump in the front ranges than go for yet another walk in the concrete jungle of my neighborhood back in YYC? Yes. 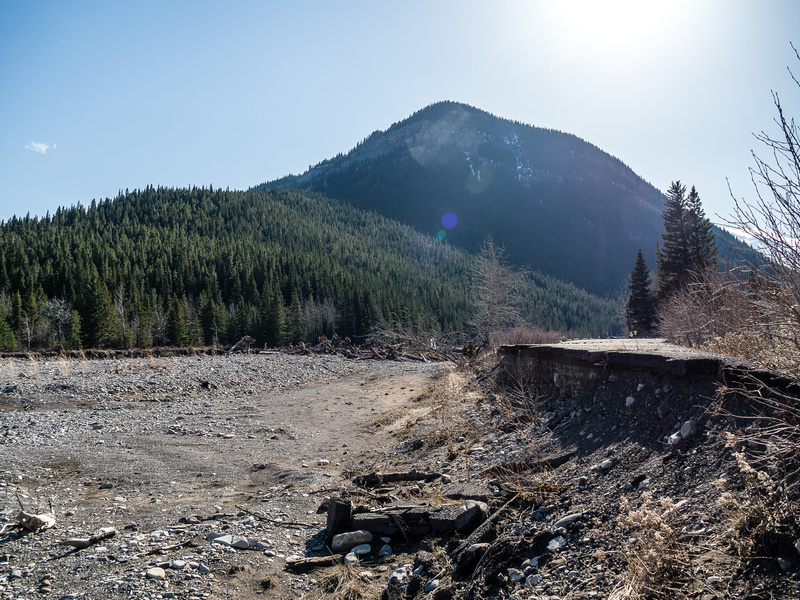 Mount Mann looms over the apocalypse that is the remains of the entrance road to the Sentinel Provincial Recreation Area - destroyed in the 2013 floods. There's a distinct trail running up alongside Cataract Creek on it's western side. Spring has finally sprung in the Rockies! 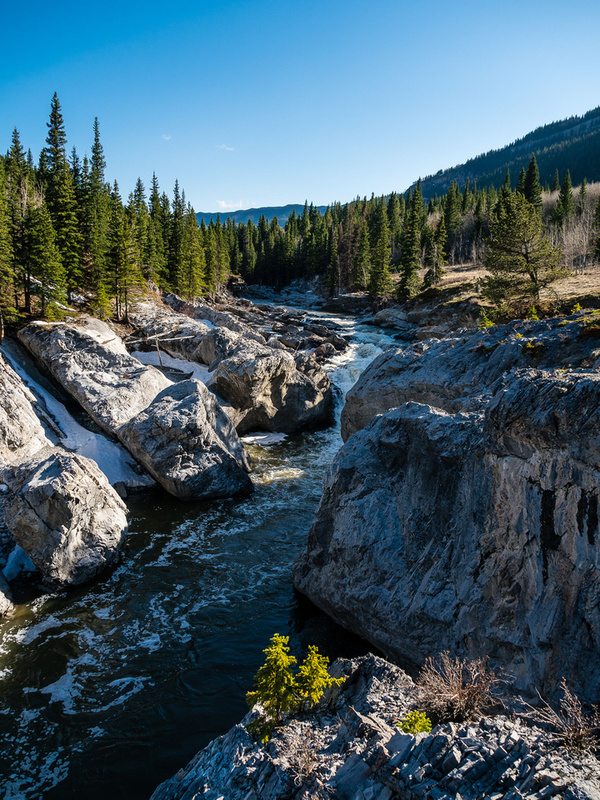 A very unexpected, charming backcountry scene awaits me mere minutes from the highway - separated only by a small ridge and a river. 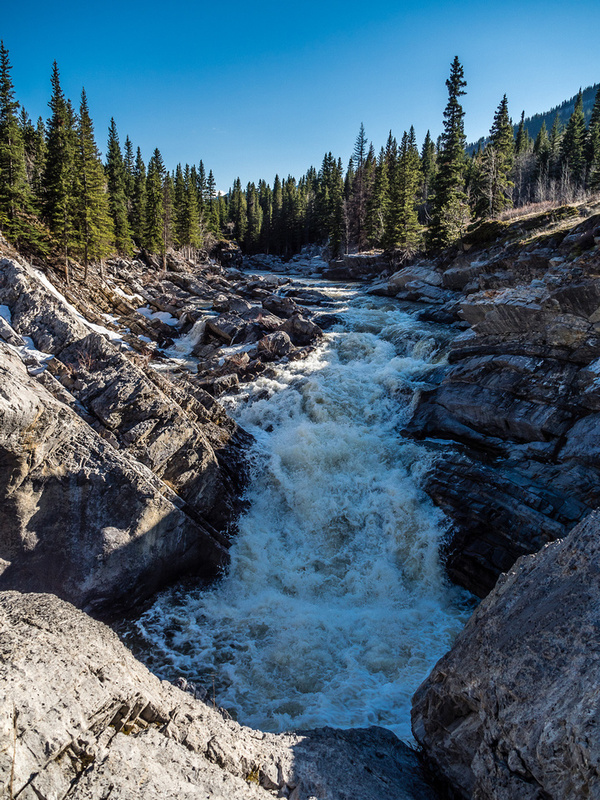 After a week of melting, Cataract Creek is running hot. How did I not know about this enchanting little creek? Time to keep hiking. The sun is setting to the west. Looking back up the landscape "ramp" that leads obviously up towards Mount Mann (L) with North Limestone Ridge in sunlight at right. 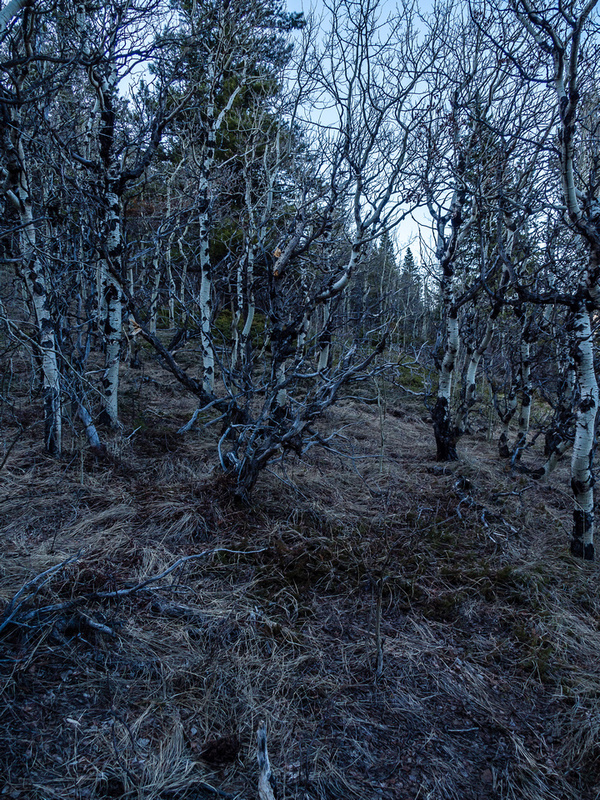 A stunted, twisted forest that looks worse than it is - probably easier without leaves. Looking back over Cataract Creek with Mount Burke in the background. Looking up to the "crux". An easy, fun rockband to scramble up to the South Ridge proper. Looking up Cataract Creek (south) from the rockband. Back to easy hiking up the south ridge towards the summit. It's further than I thought and even innocent snow patches can be crotch deep up here. Looking back along the south ridge from an open section - Hell's Ridge running from left to right in the distance here. The trail leads ever upward. At the summit - views aren't stunning, but they're a heckuva lot better than the view from my sidewalk back in YYC. Lovely views up Cataract Creek towards Mount Burke with Plateau Mountain at distant center-right. 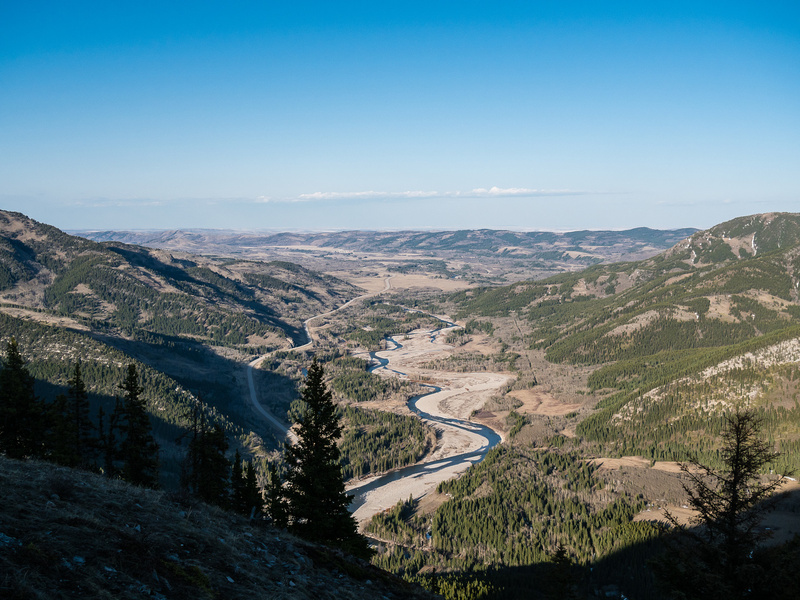 Looking over the Highwood River, through Eyrie Gap towards Eden Valley and the Prairies east of the Rockies. Raspberry Ridge rises over Hell's Ridge to the southwest. It's starting to feel a bit lonely back in the valley as the shadows lengthen. 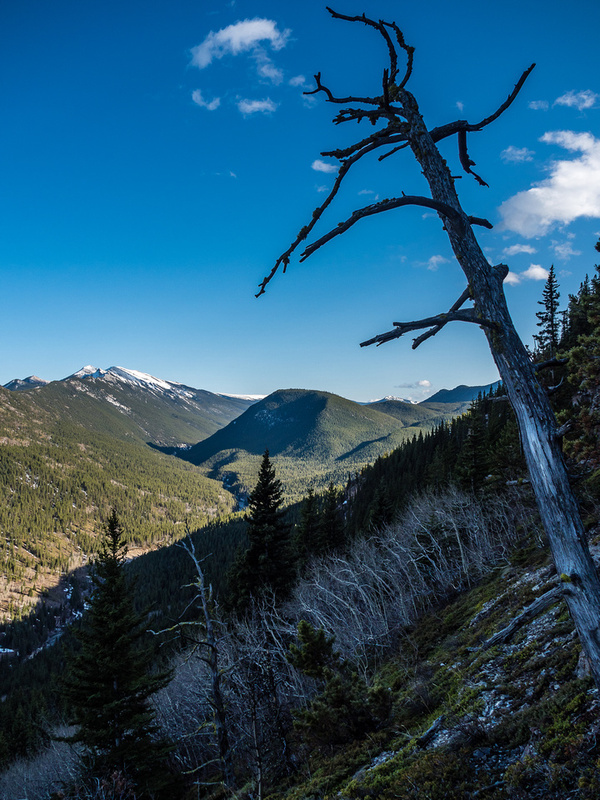 A great shot from the hike back along Cataract Creek showing the lovely area tucked into a valley just south of Hwy 541 across the Highwood River. 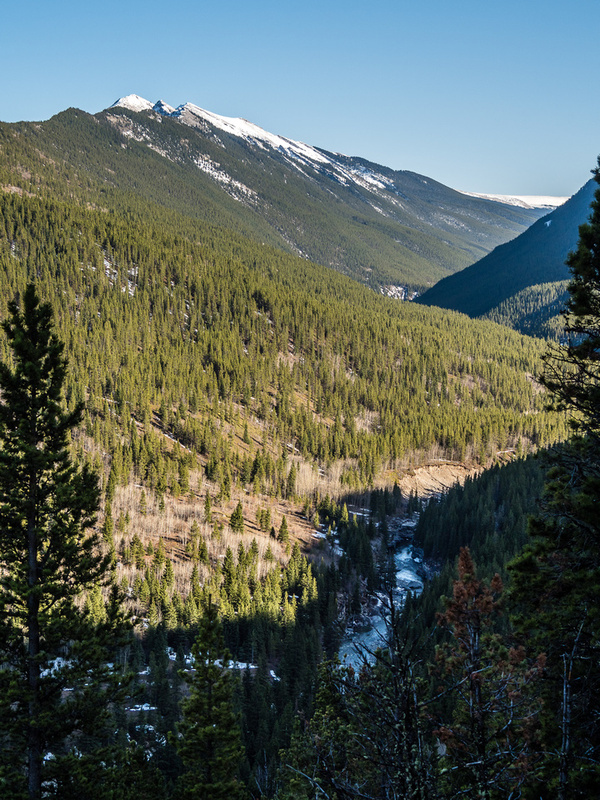 I found myself marveling, not for the first time, on the complete lack of other cars as I drove past Eden Valley towards the foothills and Kananaskis Country in beautiful late afternoon sunshine. I spotted one other car parked at the Bull Creek Hills trailhead and continued on, shortly arriving at the old Sentinel Provincial Recreation Area, now just a gravel berm and pull-off along hwy 541 after being destroyed in the 2013 floods. 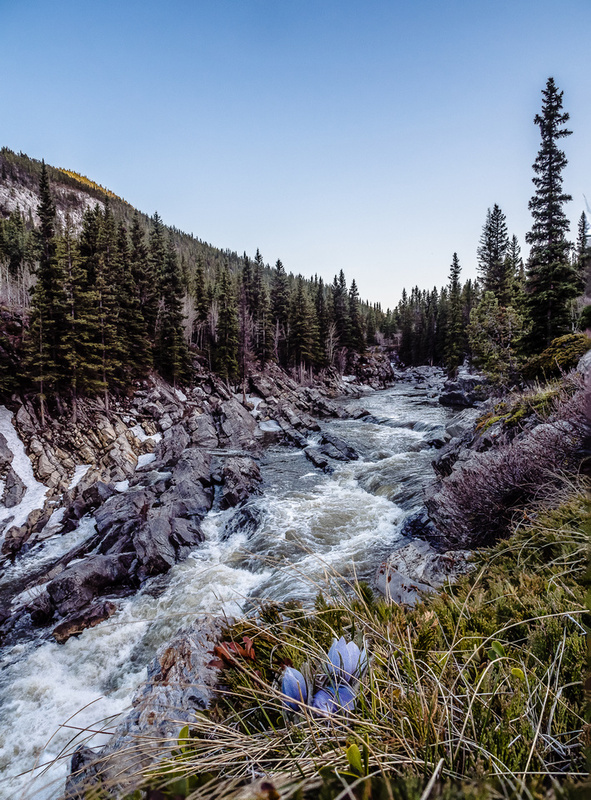 I was a bit concerned about the flow rate / water levels of the Highwood River, especially considering that it was 18:00 after a few warm days of furious snow melt in the surrounding mountains. On my drive towards the Rockies, I was surprised by how white they still were – apparently a weekend weather event had dumped even more snow along the Divide peaks. Sure enough! As I waded the river towards a faint Cataract Creek trail on the far side, I was taken aback by the strong current. My old runners almost lost their grip on slick rocks underfoot, but I made it across the knee-to-thigh deep current and changed into my hiking boots. Bob Spirko’s route started on the “wrong” side of Cataract Creek for some reason, but you should find the established trail on the west side of the creek on the Mount Mann side which saves you crossing the Highwood River after the creek runs into it, and saves you having to cross the creek after already crossing the river. 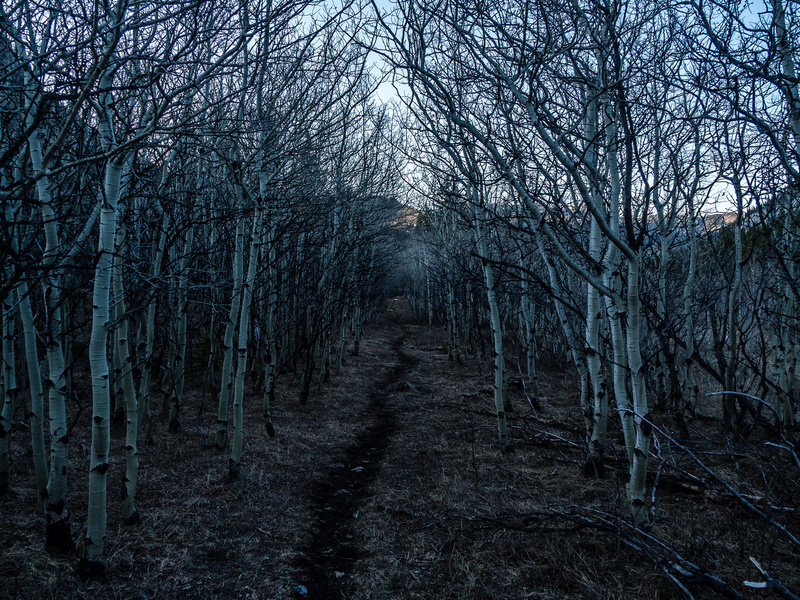 As soon as I started up the well established Cataract Creek trail, I felt very alone in the landscape. 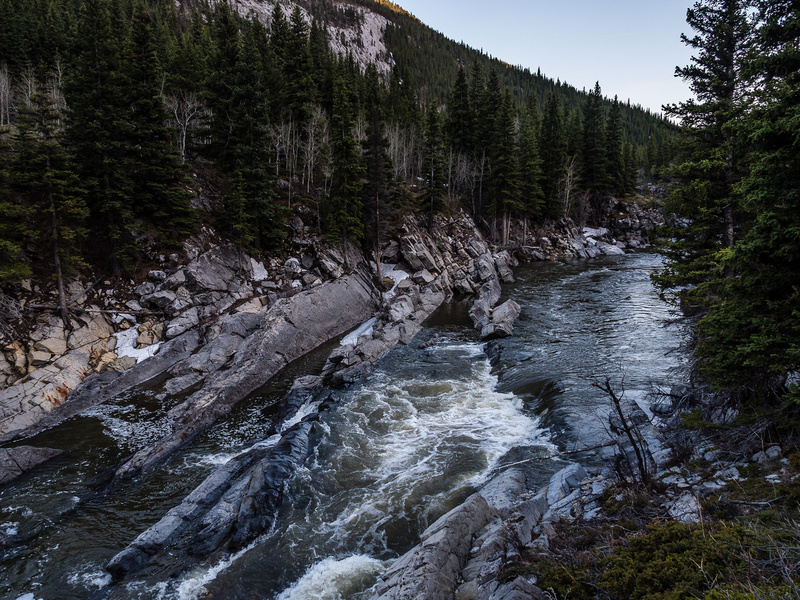 There was a strong wind blowing, the creek was very noisy to my left and I was keenly aware that no other human was within many kilometers of me. There’s something about starting a trail with a river crossing. It isolates you more somehow. I was also aware that running into a bruin was very possible considering the area, the weather, the wind / noise and the fact that I was solo. Soon I stopped worrying about the isolation and bears and started enjoying the atmosphere instead. And what an atmosphere it was! 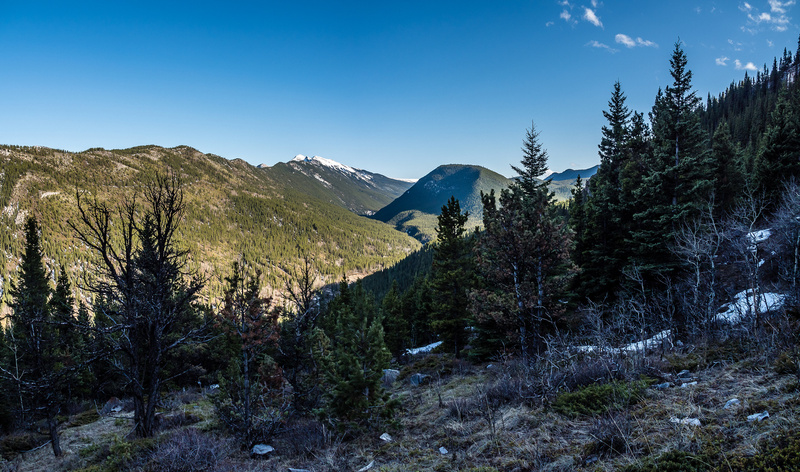 In a repeat of what occurred on Three Cairns Hill a few days earlier, I was caught off guard by the tranquil landscape that greeted me in the narrow valley between Zypher Creek Ridge and Mount Mann after grunting up and over a small ridge from the Highwood River. 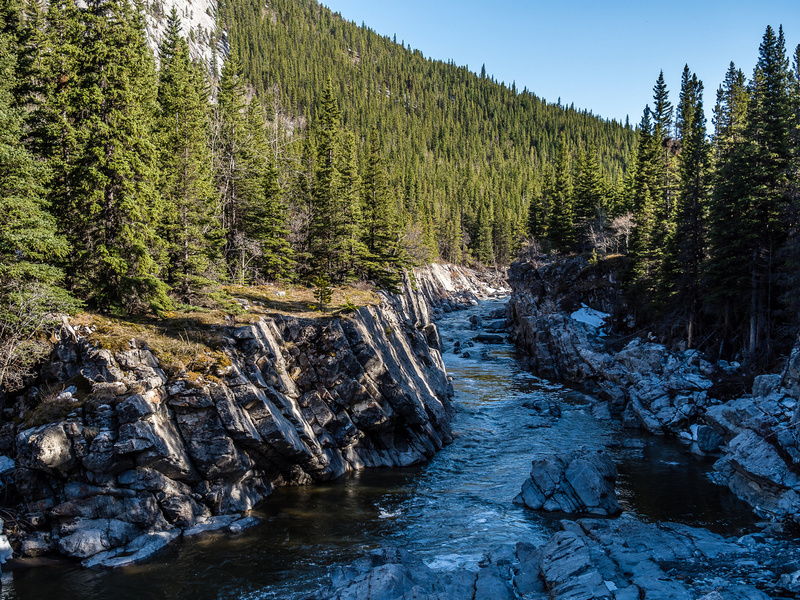 I’d never even heard of Cataract Creek before, but it turns out to be an interesting watercourse, running through a narrow, exciting canyon with pretty wild scenery – mere minutes of hiking from the highway. 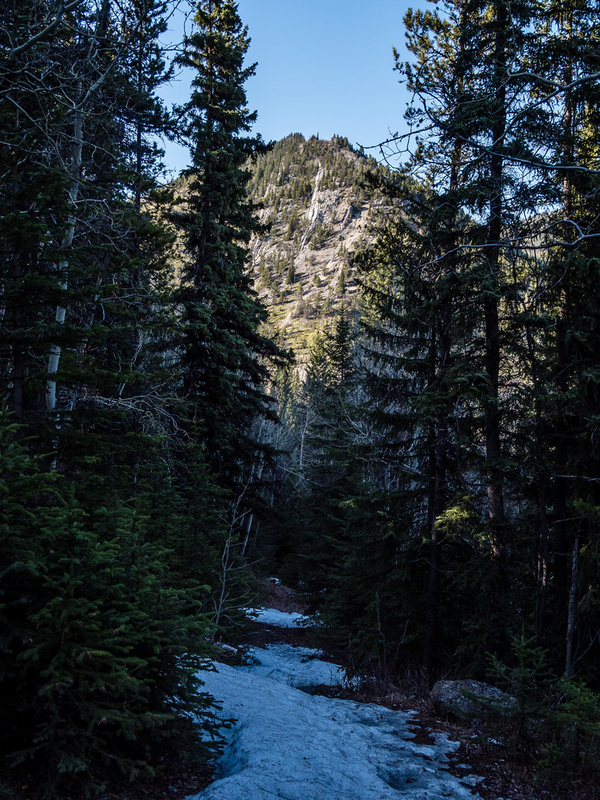 I felt transported to another area almost instantly as I made the descent towards the tumbling creek along a good trail – thankfully snow free at this point. 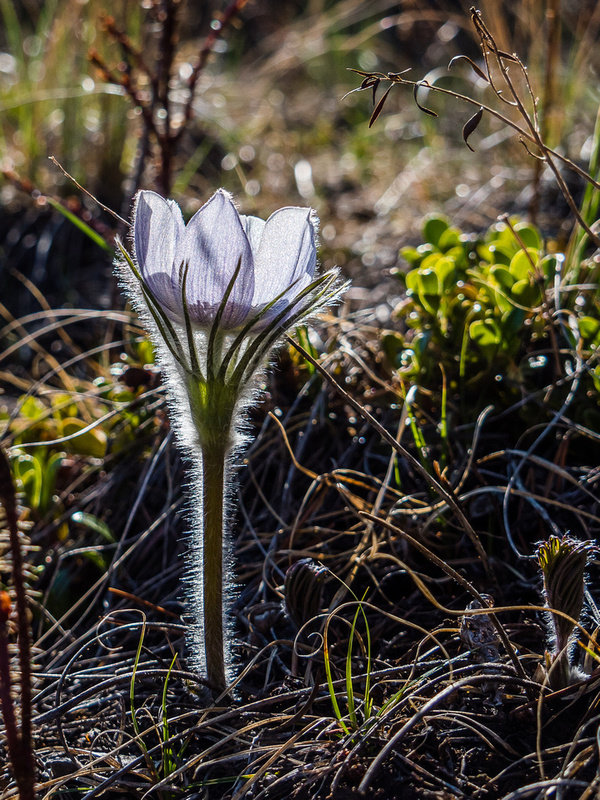 I was delighted to note some Prairie Crocus growing on south facing slopes – a sure sign that Spring was finally here to stay. After taking a number of photos of the lovely creek, I turned my attention to the rest of the route. 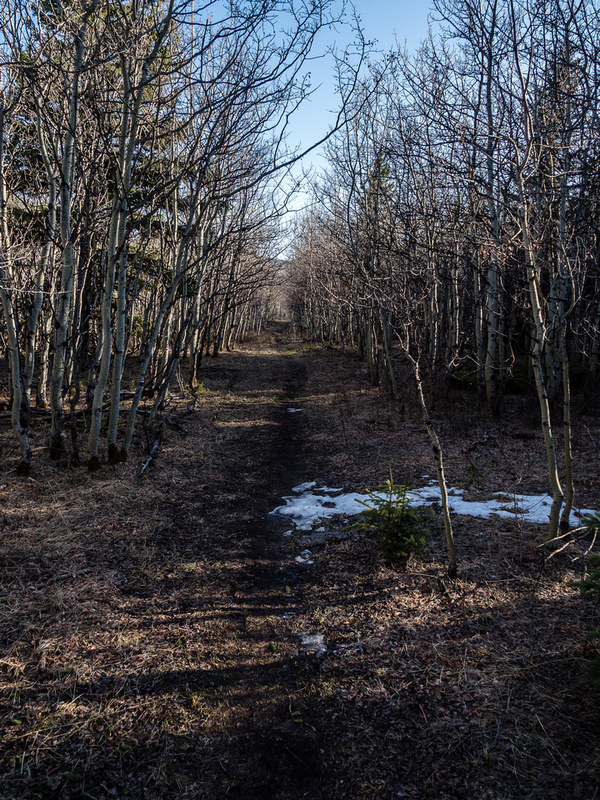 After pushing on through some interesting stands of Aspen I found myself at what looked like a bit of a shortcut up a ramp leading to the south ridge of Mount Mann. There were some rockbands right near the top of this ramp, but they looked benign from my vantage so I followed this route rather than spending time walking further up valley. Despite looking fairly bushy from the trail, the ramp turned out to be surprisingly easy and fun to ascend. 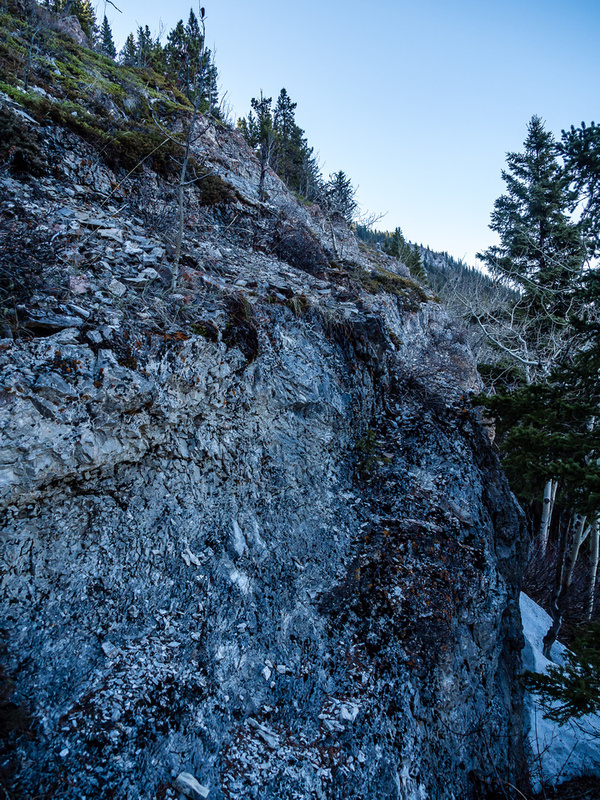 Trees were spaced out reasonably and despite some thick stands of stunted trees just below the rockband, they assisted more than they harmed – I used them to pull myself up the steep slope! The rockband was easy scrambling and soon I was on the south ridge looking out over North Limestone Ridge and Zephyr Creek Hills. Once on the south ridge I figured 5-10 minutes should have me on the summit. Nope. In a very consistent and annoying theme for this spring season, I found myself wallowing in knee, to crotch deep snow on the ridge! How the hell did that happen?! Oh well. 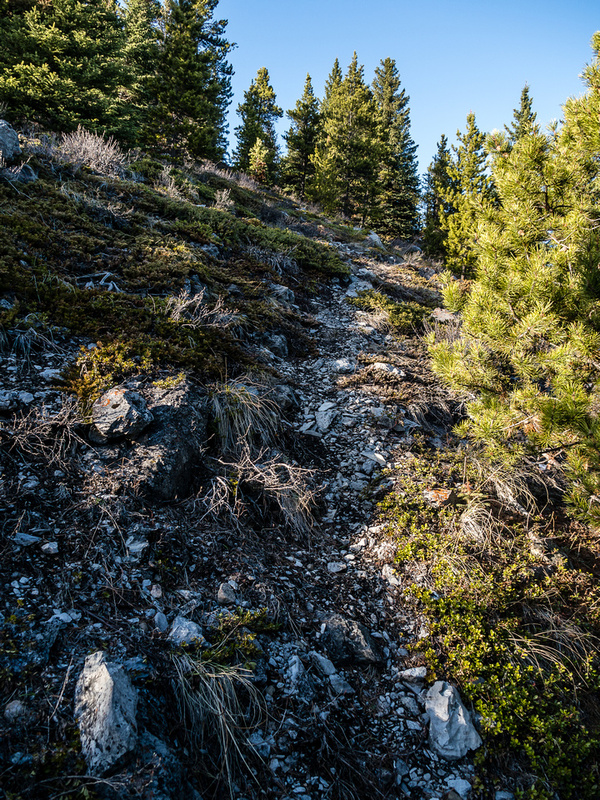 Despite its best efforts, the mighty Mount Mann did not prevail and eventually I managed to follow the treed south ridge to the apex of the mountain in warm, evening sunlight. The views weren’t spectacular, of course, but considering the alternative (views of my neighborhood houses) this wasn’t too shabby either. After a brief summit stay, it was time to hike back down to Cataract Creek and the exit trail. 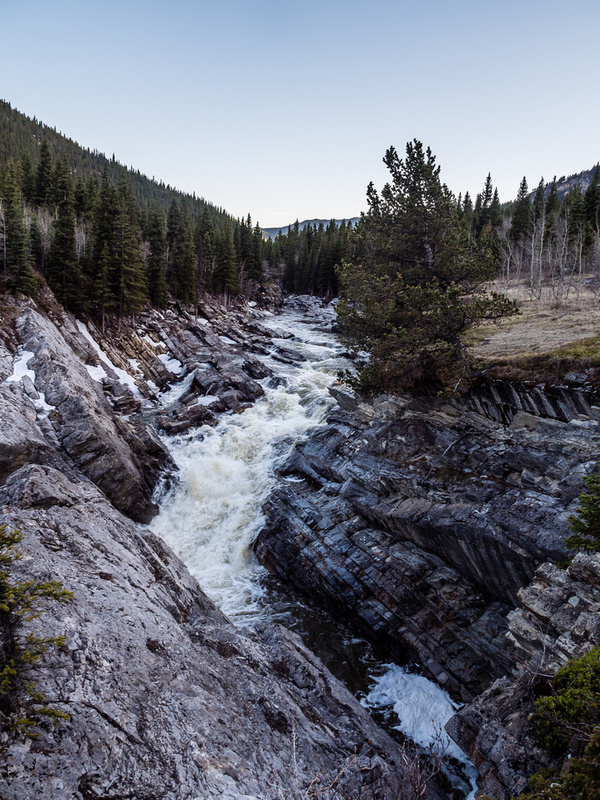 I was slightly nervous about how high / fast the Highwood River might be on return. It was plenty strong already on my way in and after a very warm day like the one that was just ending, I wasn’t sure what a few more hours would produce. The descent was quick and easy with some more great, early evening views along the creek. The river wasn’t too bad (no worse than on approach) and soon I was back at the truck.I really enjoyed Mount Mann as a short, after work hike. I think the valley trail along Cataract Creek would be a very nice place to explore on its own some day.